BANGKOK Asian stock markets were mostly higher Friday as momentum carried over from yet another record high on Wall Street. Trading remained thin, however, as stock, bond and commodities markets were closed for Good Friday in the U.S. and Europe, along with large parts of Asia. The Standard and Poor's 500 index closed Thursday at its highest level, driven by more encouraging data on the U.S. economic recovery. The government said the economy grew at an annual rate of 0.4 percent in the October-December quarter, slightly better than previous estimates. The revision reflected stronger business investment and export sales. President urges Cyprus to "share the burden"
Those markets open in Asia reflected the good news out of the U.S.: South Korea's Kospi rose 0.6 percent to 2,004.89. Taiwan's TAIEX advanced 0.7 percent to 7,918.61. 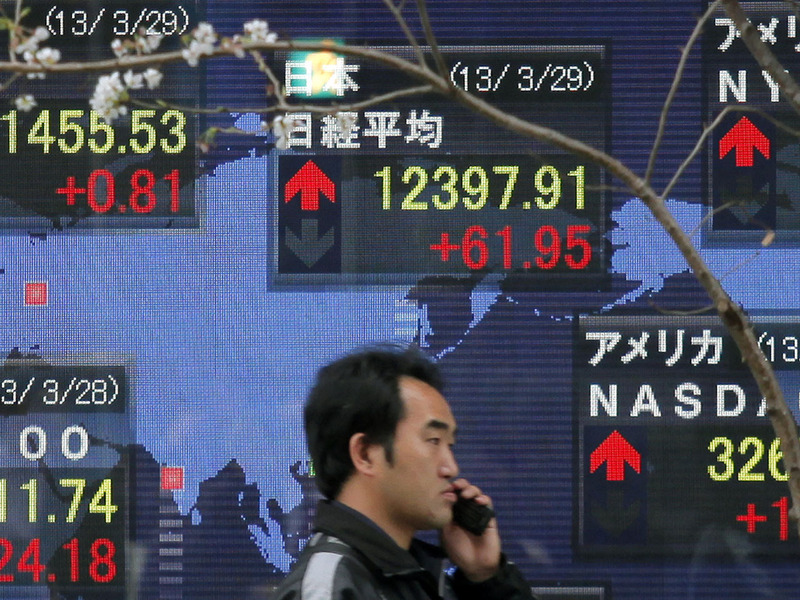 Japan's Nikkei reversed early losses to rise 0.5 percent and close at 12,397.91. Gains were muted, however, as the yen leveled off against the dollar and the government released figures for February showing the country's jobless rate edging up while industrial production fell slightly. Newly appointed central bank governor, Haruhiko Kuroda, has pledged to work with the government to end decades of growth-inhibiting deflation. His outspoken calls for action have raised hopes for results but some analysts said they may also have created unrealistic expectations for a turnaround. "Unfortunately, the markets' expectations of the new Governor are so high that they will be almost impossible to meet, let alone beat," said analysts at Capital Economics in a market commentary. Shares in mainland China were mostly flat amid limited trading volume, analysts said. The Shanghai Composite Index was nearly unchanged at 2,236.62 while the Shenzhen Composite Index fell 0.2 percent to 927.89. Peng Yunliang, a Shanghai-based analyst, said shares in brokerage houses declined following the release Thursday of official policies aimed at tightening control over wealth management products. Markets in Hong Kong, India, Australia, New Zealand, Indonesia, Philippines and Singapore were shut for Good Friday. In Europe on Thursday, markets responded positively to the calm reopening of Cyprus's banks. Banks in the Mediterranean island nation were shut for nearly two weeks as the government negotiated a rescue loan from international lenders to prevent the financial system from collapsing. However, Italy's political uncertainty will also remain in the spotlight. Following inconclusive elections around a month ago, the country is still without a government, and that's raised concerns over its future economic path. In currencies, the euro was up slightly to $1.2824 from $1.2822 late Thursday in New York. The dollar fell to 94.09 yen from 94.13 yen. The New York Mercantile Exchange, where benchmark oil is traded, was closed for the Good Friday holiday.